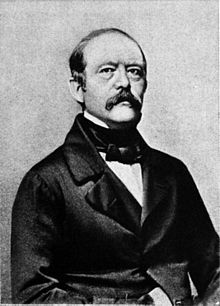 Ba státaire Gearmánach é Otto von Bismarck (1 Aibreán, 1815 – 30 Iúil, 1898) (Otto Eduard Leopold von Bismarck-Schönhausen, Fürst von Bismarck-Schönhausen, Herzog zu Lauenburg as Gearmáinis), a bhí ina Phríomh-Aire ar an bPrúis (1862-1890) agus ar an nGearmáin (1871-1890) le linn aontú na Gearmáine. Junker, nó mionuaisle Prúiseacha ab ea muintir Bismarck. Rugadh Otto i Schönhausen in aice le Stendal ar an 1 Aibreán 1815, agus tháinig sé i gcrann i Kniephof sa Phomaráin (lámh le Nowogard i bPolainn an lae inniu), nuair a tháinig a athair Ferdinand i seilbh eastát eile i ndiaidh bhás a sheanuncail. Bhí sé seacht mbliana d'aois, nuair a chinn a mháthair Wilhelmine (née Mencken) filleadh ar Bheirlín, agus thug sí Otto, an mac ba sine aici darbh ainm Bernhard, agus a hiníon Malwine léi. D'fhreastail Otto ar an meánscoil úd Gymnasium zum Grauen Kloster. Ansin, tháinig sé i dteagmháil le baill de rítheaghlach na Prúise, mar atá, muintir Hohenzollern. Ina dhiaidh sin, rinne sé staidéar ar an dlí ar Ollscoil Georg August i nGöttingen. Bhí clú an liobrálachais ar an ollscoil. Le linn a staidéir ansin, bhí Otto óg ina bhall de Corps Hannovera, cumann mac léinn a chleachtadh pionsóireacht, agus ba mhinic a chonacthas an claíomh i lámh Otto. Níos deireanaí, d'aistrigh sé go hOllscoil Friedrich Wilhelm i mBeirlín, áit ar bhain sé amach a chéim ollscoile sa bhliain 1835. Ina dhiaidh sin, chuaigh sé i mbun oibre ina oifigeach cánach sa státseirbhís in Aachen. Ní raibh obair an státseirbhísigh ag éirí go rómhaith leis, áfach, nó bhí sé róthugtha do na cailíní agus don chearrbhachas. Sa bhliain 1838, chuaigh sé sna saighdiúirí go ceann bliana. Chaith sé an chuid ba mhó den tréimhse i nGreifswald, áit a raibh deis aige eacnamaíocht talmhaíochta a fhoghlaim. Sa bhliain 1839, fuair a mháthair bás. Ansin, shocraigh sé síos san eastát talmhaíochta le dul le feirmeoireacht. Thug seisean agus a dheartháir Bernhard aire don trí eastát a bhí ag a n-athair, mar atá, Kniephof, Jarchlin, agus Külz. Nuair a toghadh Bernhard ina bhall den Landrat (comhairle an chúige) sa bhliain 1841, fágadh Kniephof agus Külz faoi Otto, agus ba é Bernhard a fuair Jarchlin. Ba é an t-athair a bhí i mbun na dtailte i Schönhausen. Sa bhliain 1845, arís, cailleadh an t-athair, agus thit sé ar chrann Otto aire a thabhairt do sheilbh an teaghlaigh i Schönhausen féin. Nuair a bhí Otto óg, bhí cáil an bhuachalla bháire air. Tháinig athrú air sin, áfach, nuair a chuir sé suim sa Chráifeachas, gluaiseacht dianchreidimh an Liútarachais. Is dócha gurbh i Johanna von Puttkamer (1824-1894) ba mhó a chuir sé spéis, cailín a bhí ina ball den ghluaiseacht seo, nó phós sé í sa bhliain 1847. D'éirigh leis an bpósadh go gleoite, agus rugadh triúr clainne dóibh, mar atá, Marie (1848-1926), Herbert (1849-1904) agus Wilhelm ("Bill", 1852-1901). Suíomh Schloß Schönhausen, áit bhreithe Otto von Bismarck, ar an 20 Iúil 2005. Leag rialtas Phoblacht Dhaonlathach na Gearmáine an mainéar sa bhliain 1958. Sa bhliain 1845, toghadh ar Chomhairle Chúige (Provinziallandtag) na Sacsaine é, a thagadh le chéile i Merseburg. Dhá bhliain ina dhiaidh sin, cuireadh comhairlí na gcúigí Prúiseacha le chéile in aon pharlaimint amháin, an Chomhairle Aontaithe, agus ansin, bhí ridirí an chúige sásta é a vótáil isteach ansin mar ionadaí teachta. Ba é an Rí Friedrich Wilhelm IV a bhunaigh an pharlaimint nua seo, nó bhí sé díreach ag iarraidh iarnróid a thógáil le tailte scaipthe na Prúise a cheangal dá chéile, agus leis na hiarnróid a mhaoiniú, chaithfeadh sé fiacha a tharraingt ar an stát. De réir an dlí, áfach, ní raibh cead aige an stát a chur i bhfiacha gan faomhadh a fháil ó na hEastáit. Mar sin, chuir sé gairm chruinnithe ar na hEastáit, agus sin mar a tháinig parlaimint aontaithe na Prúise ar an bhfód. Ina bhall den Pharlaimint seo, bhí Bismarck ag tacú leis na Coimeádaigh, agus eisean ar an urlabhraí ab éifeachtaí a bhí ag an bhfaicsean seo sa chomhthionól. Ba iad na Liobrálaigh a bhí ina dtromlach mór ansin. Sa bhliain 1848, phléasc Réabhlóid an Mhárta amach sa Ghearmáin. Bhain na cathanna baracáide an-stangadh as Bismarck, agus thacaigh sé go láidir leis an status quo agus leis an monarcacht. Bhí sé chomh buartha faoin réabhlóid is gur áitigh sé ar na hoifigigh i mBeirlín agus i Magdeburg cogadh a chur ar na réabhlóidithe, ach ní raibh gar ann. Nuair a tháinig ionadaithe na stát Gearmánach le chéile sa Chomhthionól Náisiúnta i bhFrankfurt, agus iad ag éileamh aontú na Gearmáine in aon stát náisiúnta amháin, bhí Bismarck go mór mór in aghaidh an smaointe seo. Bhí sé ar duine acu siúd a chuir tús leis an Neue Preussische Zeitung, nuachtán na gcoimeádach Críostaí, ar a dtugtaí "Nuachtán na Croise" (Kreuzzeitung) go coitianta. Cé nach raibh oiliúint an taidhleora ar Bismarck, cheap an Rí Friedrich Wilhelm é mar ambasadóir ar Chomhairle Cónaidhme na Gearmáine i bhFrankfurt é. Ansin, bhí sé go tréan in aghaidh na hOstaire, nó theastaigh uaidh na stáit bheaga Ghearmánacha a aontú in aon chónaidhm faoin bPrúis, beag beann ar an Ostair. I ndiaidh na tréimhse a chaith sé i bhFrankfurt, bhí sé ina ambasadóir i gCathair Pheadair agus i bPáras. Tháinig Wilhelm i gcomharbacht ar a dheartháir sa bhliain 1861. Bhí an rí nua, Wilhelm I, i gcomhrac le móramh Liobrálach an Landtag agus, i ndiaidh molta óna sheanchara Pietach Albrecht von Roon, an t-Aire Cosanta, d'iarr sé ar Bismarck freastal mar Phríomhaire air. Ní raibh Bismarck sásta an post a ghlacadh ach amháin go mbeadh lán-chumhacht ghnóthaí an rialtais aige agus níor thosaigh sé go dtí go raibh a théarmaí bainte amach aige ar an 23 Meán Fómhair 1862. D’fhreastail Bismarck sa phost sin agus mar Aire Gnóthaí Eachtracha na Prúise beagnach gan stad ón lá sin go dtí 20 Márta 1890. Cé go raibh sé in oifig mar ionadaí pearsanta an rí agus cé go raibh cumhacht an reáchtála agus an chánachais ag an Landtag, rialaigh sé an ríocht beagnach ina aonar ar feadh ocht mbliain is fichead. Níorbh náisiúnaí ó dhúchas riamh é Bismarck agus chuir sé go láidir i gcoinne Chomhdháil Náisiúnta na Gearmáine le linn Réabhlóid 1848. Mar sin féin, d’aithin sé go raibh brú na staire ag atheagrú na hEorpa mar stáit náisiúnacha i lár an 19ú aois. Mar shampla, bhí an Iodáil aontaithe sa bhliain 1860 faoi chinnireacht Ríocht Phíodmant. Spreag sé cogadh i gcoinne na Danmhairge sa bhliain 1864 chun sprid an náisiúnachais a tharraingt le chéile i measc na 39 saor-stáit na Gearmáine agus roinn An Phrúis agus An Ostair Diúcacht Schleswig-Holstein eatarthu ina dhiaidh. Buaileadh an Impireacht Habsburgach agus a chomhghuaillithe An tSacsóin, Hannover agus An Bhaváir, i ndiaidh gan ach sé seachtain troda. Ghabh An Phrúis seilbh ar Holstein, Hesse-Nassau, Hannover agus Frankfurt. Aithníodh An Phrúis mar an stát ba chumhachtaí sa Ghearmáin í.
Chaill An Ostair gach tionchar a raibh aici i ngnóthaí inmheánacha na Gearmáine. Agus nuair a spreag Bismarck cogadh i gcoinne na Fraince sa bhliain 1870, throid gach stát eile sa Ghearmáin ar thaobh na Prúise. Tar éis bua tubaisteach a ghearradh ar Arm an Impire Napoleon III i gcath Sedan, d’fhógair prionsaí na Gearmáine Wilhelm I mar Impire na Gearmáine i bpálás Versailles ar an 18 Eanáir 1871. Tháinig Comhnaidhm na Gearmáine Thuaidh i bhfeidhm i ndiaidh an chogaidh i gcoinne na h-Ostaire. Scríobh Bismarck bunreacht nua dó. Ba é sin bunús rialtais an impireacht nua. Mar sheansailéir (príomh-aire), ní raibh sé freagrach do Pharlaimint an Reichstag, ach don impire féin. Agus ós rud é gurbh sa Phrúis a raibh cónaí ar mhóramh daonra an stáit, bhí seilbh ar an dá phost ba chumhachtaí sa Ghearmáin aige. Bhí Bismarck sásta stiúradh cúrsaí cosanta agus eacnamaíochta a ligean dá airí. Ar dtús, thaobhaigh sé leis na Liobrálaigh chun saorthrádáil a chosaint agus d’aontaíodh na córais airgid, thomhais, cánacha agus dlí a raibh i bhfeidhm sna stáit éagsúla roimhe sin. Le linn na mblianta i ndiaidh lagair eacnamaíochta 1873, tháinig deireadh le réim na saorthrádála san Eoraip. Thosaigh Bismarck ag taobhú leis na Coimeádaigh chun talmhaíocht agus tionscal crua na Gearmáine a chosaint trí tháillí a leagan ar earraí iompórtáilte. D’fhás cumhacht eacnamaíocht na Gearmáine go mór le linn a réimis. Le linn réim na Liobrálach, chuaigh sé i gcomhrac leis an Eaglais Caitliceach (an Kulturkampf) chun córas oideachais tuata a bhunú. Tháinig deireadh leis an gKulturkampf tar éis bás an Phápa Pius XI ar 7 Feabhra 1878. Ach, ós rud é go raibh ar thaobh na gCoimeádach ag an am sin, thosaigh sé ar achrann i gcoinne na Sóisialaigh. Agus chun tionchar an SPD, an Páirtí Sóisialta Daonlathach, a mhaolú, bhunaigh sé an chéad córas leasa sóisialacha ar domhain le pinsin agus árachas oibre, atá i bhfeidhm fós sa Ghearmáin. Choimeád Bismarck greim docht ar ghnóthaí eachtracha le linn a shaoil pholaitiúil uile. Ní raibh aon suim aige riamh sa choilíneachas. Nuair a thosaigh achrainn idir cumhachtaí Iarthar na hEorpa faoin Aifric agus idir An Rúis, An Tuirc agus An Ostair faoi Na Balcáin, ghlacadh leis mar idirghabhálaí macánta. Tháinig barr a réimis le linn Comhdháil Beirlín sa bhliain 1878 a chuir deireadh leis an gcogadh idir An Rúis agus An Tuirc. Cé gur spreag sé trí chogadh chun An Ghearmáin a aontú, ba é síocháin na hEorpa a phríomhaidhm ina dhiaidh. Ar dtús, chuaigh sé i gcomhghuaillíocht leis An Ostair agus An Rúis (Dreikaisersbund, Conradh na dTrí Impire) chun an status quo a chosaint in Oirthear na hEorpa ach, nuair a d’fhás an naimhdeas idir an mbeirt eile le linn conspóidí na mBalcán, b’éigean dó taobhú le Impireacht na Habsburg. D’éag Wilhelm I ar 9 Márta 1888 agus níor mhair a mhac Friedrich III ach trí mhí ina dhiaidh. Ba é garmhac Wilhelm I, Wilhelm II, a tháinig i gcomharbacht ar an 15 Meitheamh agus é gan ach 28 bliain d’aois ag an am. Bhí tuairimí éagsúla ag an impire nua faoin nGearmáin agus ní raibh sé sásta ligean le Bismarck rialú gan éinne eile ag cur isteach air. D’éirigh easaontas idir an mbeirt, go mór mór i gcúrsaí eachtracha, agus ní raibh aon foighne ag Wilhelm le polasaithe cúramacha an tseansailéara. Tharla an achrann deireanach eatarthu faoi molta reachtaíochta Bismarck in aghaidh an tsóisialachais. D’éirigh sé as oifig ar an 20 Márta 1890. Thréigh Bismarck Beirlín agus chuir sé faoi ina eastáit i Varzin (anois Warcino na Polainne). I ndiaidh bás a bhean sa bhliain 1894, d’aistrigh sé a áit cónaithe go dtí eastáit eile leis i bhFriedrichsruh, lámh le Hamburg, áit inar fuair sé féin bás ar an 30 Iúil 1898. Tugadh an leathanach seo cothrom le dáta an 30 Iúil 2017 ag 10:19.